The Southern Cross Constructions crew of Euan Mc Nicol, Aaron Links and Trent Barnabas became the 2009 Giltinan 18ft Skiff champions today after one of the "craziest" races seen on Sydney Harbour. Although the talented trio could do no better than fourth placing today, their overall pointscore of 18 points was just enough to defeat Active Air-2UE (Matthew Searle, Dan Wilsdon, Archie Massey) by one point, with Gotta Love It 7 (Seve Jarvin, Sam Newton, Tom Clout) three more points back in third place. The final outcome was almost unbelievable as Southern Cross Constructions looked to have absolutely no hope for more than three-quarters of today's race. Trailing the leader by four minutes and ten seconds at the first windward mark (and almost totally at the back of the fleet) Southern Cross' crew could only watch as most of their main opponents were vying for the lead. Victory today went to the 2000 Giltinan winner John Winning with crew of Andrew Hay and David Gibson in Yandoo. They defeated the young Panasonic crew of Jonathan Whitty, Dan Higlett and Tom Anderson by 1m12s with Active Air-2UE a further 15s back in third place. A lack of wind at the scheduled start time saw the start delayed for more than 20 minutes before he elected to go with the four-lap windward-and-return course. appliancesonline.com.au (John Winning Jr.) won the start and led by 20s from Smeg (Hugh Stodart) at the windward mark. Gotta Love It 7 was third, closely followed by SLAM (Grant Rollerson), Active Air-2UE, Panasonic, Macquarie Real Estate (Micah Lane), Yamaha NZ (Scott Kennedy) and Yandoo. Macquarie Real Estate grabbed the lead on the spinnaker run back to the twin bottom rounding marks with Gotta Love It 7 only 15s further back. Gotta Love It 7 took over on the following windward leg and established a comfortable lead until the end of the third lap. Just when it looked as though the ‘7' team would win the race and take the title, everything went 180-degrees and the championship again became wide open. Yandoo, Active Air-2UE and Panasonic made gains on Gotta Love It 7 while Southern Cross was also starting to move closer to this leading group. As bows were turned towards the finish and spinnakers set for the final run any one of Active Air-2UE, Southern Cross or Gotta Love It 7 could become the champion - depending on the final placings of each. It was critical that Active Air-2UE could finish no worse than second, but the young Panasonic crew was sailing beautifully and relegated Active Air-2UE to third place. 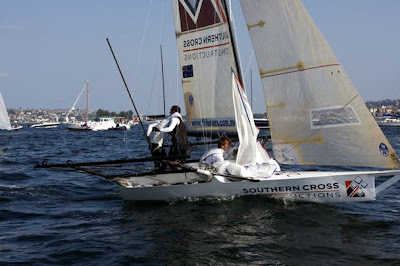 In the meantime, Southern Cross had sailed through Gotta Love It 7 and the championship suddenly belonged to Mc Nicol and his team as they finished in fourth place. The finish line was an incredible sight as skiffs were approaching from all directions. Only 6s separated the next four skiffs as Gotta Love It 7 was relegated back to eighth place. Today's result sheet, final point score are attached. Video can be seen on www.sailcam.tv.